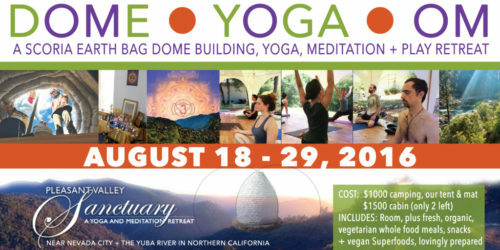 A DOME BUILDING & YOGA RETREAT! In the rolling foothills of the Sierra, exists an oasis dedicated to personal growth and spiritual unfolding. 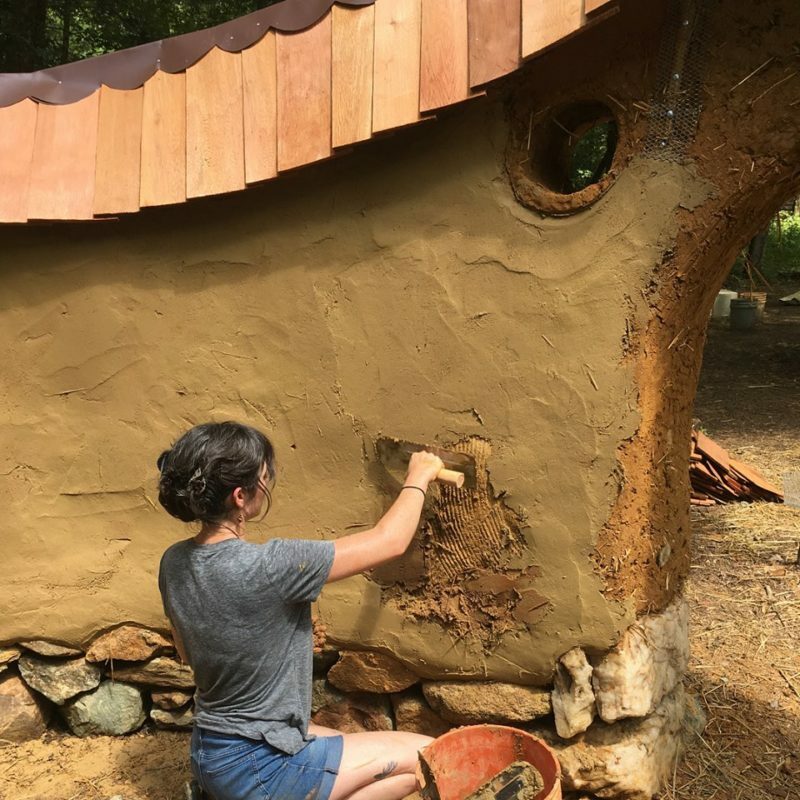 It will be here, at Pleasant Valley Sanctuary, that we’ll gather to learn how to build an earth bag dome made of scoria (lava rock) with the guidance of Lisa ~ a gifted artist and designer who specialises in green building. Join us for 10 days of daily building, yoga, meditation, and sacred architecture classes. 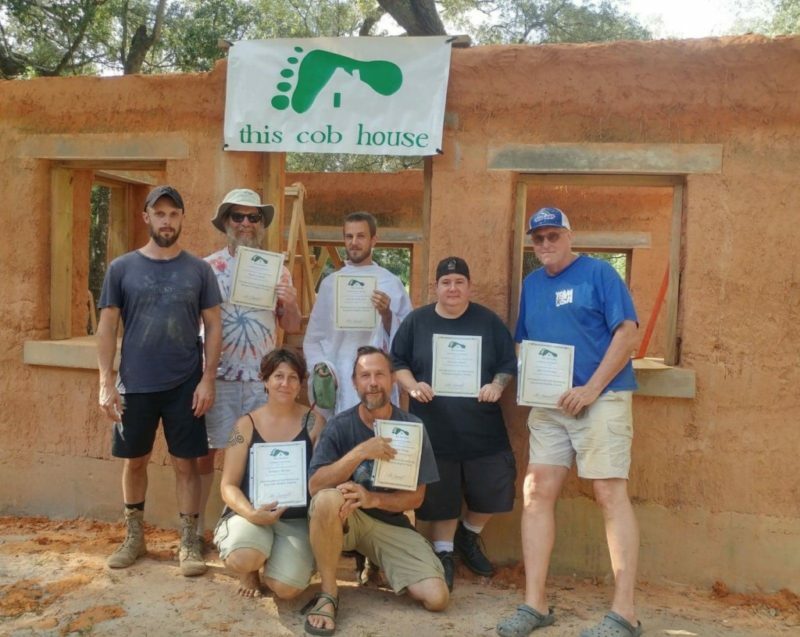 This workshop is perfect for the beginner who wishes to start their natural building career, as well as the more seasoned builder who simply wishes to hone their craft. 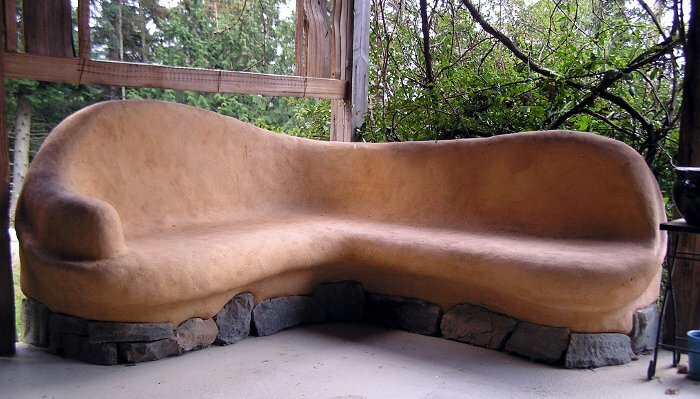 If natural building inspires you, then look no further than the earth bag dome. They are a fast, simple, inexpensive and ecologically sound form of housing. They are also extremely structurally sound and perform very well in terms of energy efficiency, staying cool in the summer and holding heat in the winter. Using lava rock is an innovation that has many advantages, including its light weight and insulative nature. Using bags of earth (pumice / gravel / stone / or scoria), they can be primarily constructed using natural materials from the earth and minimal expensive materials such as wood or steel. In addition, they are disaster proof, due to the strength of their thick and self supporting walls and the dense materials from which they are made. These low cost and multi-purpose mini-buildings are unlikely to require a building permit due to their size. They can serve as a cool space in summer, shelter in winter (for humans or animals), a storage shed, a root cellar, and more. We also love the idea of using these as meditation domes or sacred spaces for spiritual practice, ceremony, playing music or creating art; especially since the insulative nature provides great sound protection. Stepping into a dome often feels like walking into a womb made of earth. Both the shape and the natural materials create a sense of being held in a silent cocoon. The earthbag dome has a solid, earthy and organic feel. Its unobtrusive and natural appearance blends in well with the land. A huge adavantage to building with bags is the simplicity of the process. No special skills are required: It requires a lot of physical effort, but strength is not necessary because each step can be done a little at a time at a comfortable pace. We have chosen to use scoria, which is a type of lava rock, the aggregates of which tend to lock together and form stable walls that can withstand high compression loads. It is less expensive than adding cement, which means less invasive to the earth. It also adds excellent insulation and thermal mass. ~ You love the sound of having a daily yoga and meditation practice throughout this experience! Accommodations include 13’ yurt style cabins. These are small but very nice, full of sunlight and big on views. There is a shared guest bathroom that is accessible to yurt guests in the main house and an outdoor bathroom with two sinks and two showers fed by solar-heated water lines is available for use in the summer months, as is a comfortable, compostable outhouse. Linens are available. We have tent platforms and some other sweet tent sites spread throughout the property and our comfortable community room lends as a cosy chill out space with plenty of organic fruit and herbal tea available between meals. Other facilities include an earth plaster and strawbale yoga and meditation studio, as well as a beautiful outdoor yoga deck – the perfect place to gather on those beautiful summer evenings. Three meals a day will be served, with fruit, herbal tea, and artesian well water available at all times. Meals are lovingly prepared and delicious, consisting largely of fresh, organic vegetables and fruits and we can accommodate most any special dietary need. Guests are well fed with food full of life force that is simple and easy to digest. We have become accustomed to getting enthusiastic compliments on our meals. Some of our meals will be living, organic superfoods from Purium Health Products, based on their Athletes Transformation. Lisa finds that their high-quality unique whole-foods-based meals and products are very effective at providing increased energy, hydration and cellular protection for the intense work of dome building. Everyone attending will also receive a $50 gift card for free product to take home (no strings, no minimum order). ~ Fresh, organic, vegetarian meals, consisting mainly of whole foods. ~ Snacks + vegan Superfoods available.